We are in New Orleans right now. We will be on a cruise to Honduras I guess. I am not sure if I can access the Internet on the boat. If I am not able to communicate with you, I will be back on the New Year's day. I apologize in advance for the delay for shipping my sold paintings. I will do that right away when I get home. I have my painting gears with me, and will have a great time. At this holiday season, I wish you a Merry Christmas and Happy New Year. These several days I felt my brain has been short of lubricants. It didn't run fast enough to catch up what I need to do and think about. I let my intuition take over, moving here and there like a robot. I went to our local portrait painting on Wednesday night and did this head study. In a couple of days, I am traveling again. Where I am going? I will let you know soon with my postcards. This is another small painting I did in Beijing. I haven't resume painting in my studio yet. It is my technical working week for my ex-comany. Life is full of contrast. I am so happy coming back. Now I am able to post on my blog myself. Thank you Eric (my brother in Canada) for helping me posting all my Beijing photos. When I was in Beijing I did several small paintings. I didn't post them because I didn't want to overburden Eric in spending too much time dealing with creating auction pages. To facilitate my daily painting in my parents' place was a big challenge. It took me several days to setup. I got only under a half of a desk area for all my painting activities. Two shoe boxes were used as the base for my setups. I used toilet paper to wipe my brushes since I simply didn't know where to buy paper towels. Lighting was a big issue. I wasn't able to find simple incandescent light bulbs more than 40W. Painting under this condition made my really appreciate the luxury I have in America, and I was so proud of myself being able to hack a quick-n-dirty way to keep my art going. One month has passed so quickly. Tomorrow I will be on my way back to the US. Even I am still here, I have already started to miss this place. My parents are getting old. They have problems which I don’t see good solutions. I wish them the best and be prepared to be back to them as quick as possible. This is a city full of energy and opportunities. There is so much she can offer. I am excited that I have met many new friends this time, especially artists. I hope to see you again in the future. I want to thank all of you who helped me. I had a wonderful trip here. The photo I am showing today is an ideal image of Beijing, homey and beautiful. Goodbye Beijing. I will be back to see you again. My mother is in better health than my father. We went out shopping together several times. I took this photo when we went to get dumpling wraps. In Beijing, if you know the local culture and where to get things you need, living is rather easy and inexpensive. You don’t need a car. You can get almost everything needed within walking distance. I am learning more and more, but the time to leave is coming soon as well. This is my life: forever changing. I am so happy I had the opportunity to continue my art in my hometown. After my two portrait demoes, I did a one day still life painting workshop in Beijing yesterday. This is my demo painting. I want to thank Patty Hodak for putting this workshop together in a super short time, especially, she organized this workshop in the situation that my blog is not visible. I want thank all the artists for attending. they come from Canada, Germany, the Netherlands, Taiwan, Japan, and the United States. I felt so happy with this international art group. I went out with my mother doing some grocery shopping. This photo is showing she was talking with a vegetable vendor on the street. Most of people in Beijing get their grocery not from supermarkets, but the vendors like this one. The price is lower. Shopping is a big challenge for me in Beijing. I was trying to get some daily basics such as paper towels and light bulbs. It is not easy. I am really lost in my hometown. I feel really odd. I am both a native and a foreigner here. I was born in Beijing, not far from this white pagoda. I had many childhood memories around this area. Today I went the place I was born. Our old house was gone completely. I went to where I went to school. The school was gone too. But I still can find traces of old days. The white pagoda is still there. It was built in 1279 as a part of a Buddhist temple. I walked slowly in the cold Beijing winter, watching the drama of the change. The scene in front of me was felt illusive and surreal. Time is a real artist. I was speechless in front its masterpieces. In the morning I went out search for an exotic breakfast. This scene got my attention. So many people in Beijing make their living this way. I went to the Yin Yang again and did the second Demo. Next Thursday I will give a one-day still life painting workshop at this location. I feel so good I have found the opportunity to do art in my home town. BTW, if someone of you are still interested in getting my 2012 desk calendar, please click the calendar banner on the upper right corner of this blog. The art education in China emphasizes the training in basic skills. I was in an art supply store, and this photo showing the section of casts for drawing. In art schools, students spend significant amount of time doing cast drawing to develop the sensitivity of observations, obtain thorough understanding of perspectives and anatomy. This rigorous training lays a solid foundation for these artists. They have a plenty of tools handy for their creative processes. So it is not surprising that so many wonderful representational artists coming from this part of the world. I went to the Chinese Fine Art Museum today. It has a wonderful show there. I saw a painting by an artist named Leng Jun. Photo realism is not my cup of tea, but I was really stunned by his work. It is really amazing what human can do. I am wondering how much time he has spent on this work. This is the place I did that portrait demo. Yin-Yang is a small courtyard house. It is miniaturized Beijing “Ci-He-Yuan” style. All rooms are built around an open courtyard. It is very cozy and homy. It is very self contained. You may forget temporarily what is happening outside. I wish I can have a house like this. Yesterday I met a group of International artists in Beijing. They meet every Thursday (include the Thanksgiving) at a marvelous courtyard house called Yin-Yang, practicing drawing and watercolor painting. I was invited to do a demo. I felt so good being able to resume painting and this was my first painting since my last China trip, in my home town and so far away from my current home. More importantly, this is my first portrait demonstration. The light condition wasn’t ideal, but the result has turned out OK. In contrast with the post of yesterday. I want to show this one to depict what is taking over the ancient civilization. China is modernized leaps and bounds. Money is everything. People of all levels are chasing money with all their might, otherwise they will soon fall into cracks. It was a very cold day. I watch this money swirl with cold eyes. This is a typical street scene in Beijing, very the third worldish. You can get all kinds of food on the street. To me, they are very delicious, but you need a strong stomach. The street vendors have very limited space for their business. They have all the creative ways to make their business going, very primitive but functioning. As a matter of fact, I feel rather comfortable here. I can get a taste of the special flavors I missed and long for. In Austin, Song and I occasionally drive 3 hours to Chinatown in Houston, just try to quench our craving for those flavors, but we don’t always feel satisfied with the authenticity of the food there. Click here to preview images and purchase. (link to http://www.qhart.com/Events/Calendar_2012.htm). The holiday season is here. I would like to wish everybody a happy Thanksgiving, Merry Christmas, and Happy New Year. At the mean time I would like to announce that Song and I have made a desk calendar for 2012 with my paintings images. It is a snapshot of my effort in art this year. If you like to have one (or more) please click above link. The price is $10. I hope you like what I did. Thank you so much for your support to my art. The main purpose of my China trip is to see my parents. They are not in good shape. I want to see what I can do for them. My father has Parkinson’s. He has problems of walking, and requires constant attention. However within a decaying body, he still has a very alert mind. He arranged some still life designs for me, and I will paint them. Aging is photo realistic. We have no choice but facing it. We go through all seasons of life, and eventually harmonize with the world like falling leaves. All my effort is for that day to make my leaf (and leave) with maple and ginkgo colors. In my art, I stress on contrast. In my everyday life, I also try to capture any glimpses of contrasty moments. This photo is showing one of those moments: old vs. new, traditional vs. modern, feminine vs. masculine, humility vs. aggression, ... That is life. That is art. After I announced my calendar 2012, we have received massive orders, and we exhausted all our inventory in several hours. I back ordered immediately, and will received the next batch in 7 days. I sincerely apologies for the shipping delay to many of you. After we receive the back ordered batch, Song will send your order to you right away. Twenty six years ago, I left Beijing and arrived in US. At that time, The Chinese had mysterious feeling about America. “There are gold everywhere in America” was a popular saying. However for 26 years, I had worked really hard toward my American dream. On the other hand, “gold is everywhere” was true literally, but it happens only in the fall. Beautiful maple trees carpet most of the USA with dazzling golden colors. Now, many Americans think about China is full of opportunities. “Gold is everywhere” forms the Chinese dream. Holding an American passport, I am strolling on the street in Beijing. “Gold is everywhere” is literally true as well. Beautiful leaves of ginkgo trees gently spreading golden colors all over the place. It is 4:00 AM in Beijing (or 3:00 PM Nov. 16 in Austin). I don’t know if I should say good morning or good afternoon to you. Due to the jet-lag I can’t sleep. So I am recording my first note for you. I arrived last night. Everything went smoothly. Now I am staying in my room which l left 26 years ago. It brings me a very nostalgia mood. Many things in this room has been kept the same: my crib and my mom’s old keyboard, some of my brother’s furniture. The calendar on the wall was the year 2000, which is the time my brother left this room for Canada. I turned on the ceiling light by pulling a string attached to a switch located up high. I don’t see this kind of switches any more. As a matter of fact, it has been the most reliable “remote control” I have ever used and it is still functioning like a charm. I remembered my grandma used to tie the switch string to the corner of a table near her bed so she could turn on the light conveniently. We didn’t have table lamps at that time, and the ceiling light is the only light source. Time goes by so dramatically. I am sure the old switch will still clicking after I have been long gone. I am sitting at the Gate 94 of San Francisco International Airport waiting for my flight to Beijing China. About one hour later I will board my flight to Beijing. I feel really excited. I have not seen my parents for about three years. This is my last normal posting on my blog, and I am glad the test I did with my brother yesterday was successful. I took a snapshot of my flight to document this trip. Now the loudspeakers around me are speaking all kinds of languages . I have a hard time to concentrate, so I will stop now. I will talk to you again in Beijing. Starting on November 15, I will spend a month in Beijing, China. Since I may not able to view this blog there, I have teamed up with my bother. This post was done by him from Toronto, Canada via my email. What a global effort it was. I have investigated the possibility of using RSS feed to sync with another blog I have in China, but It was so difficult and I am not savvy enough for that. So I am trying this low tech way. For a month from now, I may not paint much, but I will document my travel and try my best to keep you posted about what I see and what I feel. I hope you enjoy “riding” with me to see the other side of the world. Zai-Jian (bye in Chinese). I want to express my sincere thanks to all the friends writing and praying for me. I am really touched and encouraged to continue on. In life we have seen so many "successful" people. They became well known because one or two gimmicks they have and the right timing. However their shine was short lived. Like shooting stars, Bright and soon disappeared. I want to seriously work on my art, and it is a long and difficult journey. So please bear with me, if you see I do a boring painting, or a crazy painting. That is all parts of my growing up. Our conditions are not ideal. Our time and energy are limited. We move in baby steps. However, we are progressing. This painting took me more than ten days to complete, due to my lousy time management. I started to deal with some new objects to make my painting more interesting. This painting will be sent to a gallery. I am so behind on providing works for my collectors. I am back to Austin. This is my second demo at Rosenberg. I hope all the workshop artists can practice what we have talked about, and turn my approaches into yours. Now I have finished my 2011 workshop teaching. It is a good time to calm down and examine myself as an artist, and a new entrepreneur, as a dreamer, and as practitioner.... most important, as a human being. Last night I had a dream. I dreamed I was in a hurry to attend a very important event (but I don't know what is was) in a far away place. I just had an old bicycle not going very fast. I was so out of shape and my legs were so weak. I tried all my might, but just could not pedal the bike fast enough. I was exhausted, zigzag out of balance, but my destination is far beyond reaching..... I think this reveals the worry in my mind. I have no right to complain because I am far more fortunate than many many people in the world. But I do have some wishful thinking. I wish life is much simpler. I wish I can be less busy. I wish I could paint more. I feel I have entered a difficult phase of my art development. There is a demon growing with my art and trying to destroy my art and my life. Fighting this demon takes a lot of my energy and time. I have seen more and more time I lost my battle now. If you see my art is not in good shape, that indicates I am dealing with the demon. However, I will keep going. I can't guarantee I can make it, but I will keep going. I am at Rosenberg, TX (near Houston) teaching a workshop. Thank you Diana for organizing and all the artists attending for this wonderful opportunity. The small beady red things in the painting are grape tomatoes. They are from the garden of Angie and Mike. I want to thank them for their great hospitality. The small tomatoes are so sweet. Now I understood why the part of Texas is called the Sugarland. I did another head study last night. I like the cool colors in the shadow. Happy Halloween! This is the season full of warm colors. It is the time I always reminisce my New Hampshire days (I used to lived in Keene, NH for several years), beautiful colors everywhere. In Texas, we don't have much color this year. It has been so dry. I did another head study on Wednesday night. We had another superb model. She has ideal facial features. With such a wonderful model, I could totally rely on my observation to compensate my lacking of anatomy knowledge. I am glad that these many years of daily painting practice has given me rigorous training on how to see. This painting was predominately a value study, but a slight color suggestion have given it a totally different look. I remember I read a piece of advertisement in an airport: "Simplicity is the highest level of sophistication." I really want to my painting has that kind of taste. I will continue on my figure painting exploration, but I also want to keep my small still life going. I had this brass thingy for a long time, and I saw it among other props too in many of my workshops. So It must be a common item of American daily life. But what is it for? Is it for tea or liquor? I am wondering how that skinny spout can allow any liquid go through. This is my first time painted it. It was fun. I don't know much about art history. I only know a few artists I really like. William Bouguereau is one of them. Yesterday I spent almost the entire day paint this study from Bouguereau. Lately, I have been pondering my art. I predominately paint small work still lives. If I only do that, I don't think I serious enough as an artist. I want to do more larger and figurative paintings, but I don't know how to do that. First, I need to take the challenge to tackle anatomy and many subtleties related to figures. This painting I consider is the starting point. I did have quite a bit of hard time when I painted this one, especially the hands. I will work hard and across the learning curve as quick as possible. I know this is not easy. Academic painters spend years of professional training in art schools just to manage the skill of painting people. But I will be patient and get there eventually, step by step. I went to live painting in South Austin last night. This is what I did. We had a superb model. I really enjoyed the cool reflections in the shadow. Figure and portrait painting are my true love, but I have been shying away from them because it is a relatively longer way to be successful. I detoured into still life painting because I could put aside anatomy and all subtlety of dealing with human subjects, so I can be quickly pass the basics and come to the artistic concepts like composition, colors, edges, and paint textures. Now I have achieved what I wanted in still life. and now I will try my best to paint humans more. It is more fun to paint portraits, but marketing them could be an issue. Nobody wants to put a stranger's portrait on the wall, and I don't quite enjoy doing portrait commissions from photos. So I don't know the solution. 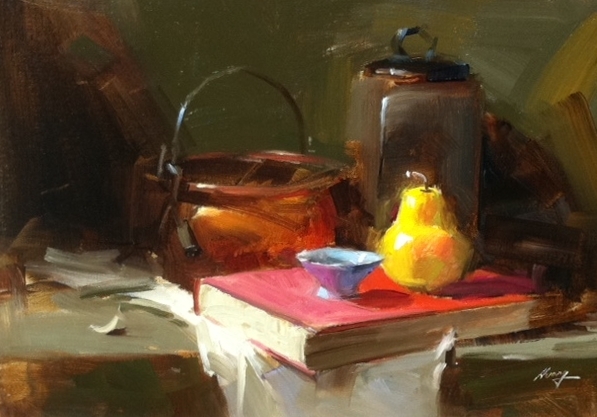 I am going to put this study on auction with a relatively low starting price. I am going to experiment placing more artistic designs on my human paintings and make them more universal, more story telling. If you have good suggestions, please let me know. Thanks. I usually have a difficulty to resume my daily painting routine after returning from a travel. If I am not paying attention enough, I could lose many days without noticed. Of course I always have tons of excuses for this time lag, but it is hurting me, not anyone else. So this time after I came back from Albuquerque, I immediately set up my studio. Even I have engineering duty this week, I did this small painting last night. This happy ghost is reminding me that my time is getting shorter. Our days go by so quickly. I can't believe we are close to Halloween again. Having said about traveling, I am planning to go to China for a month from mid November to mid December. I will stay in Beijing most of the time in my parents' place. I don't know how many my artist friends are in that part of the world. If you happened to in China too and are interested in getting together, please let me know. I should have time to paint and teach there. I know my blog is not displayable in China. Does anybody know how to sync a blogger to corresponding Chinese social media? I am sitting at my cube right now, starting my one week of engineering work for my ex-company (I need a proper name for this place). I keep a win-win relationship with my ex and agree to work a week per month as an engineer. This work pattern works out so far so good. This my third demo at my Albuquerque workshop. I enjoyed very much those several days in New Mexico. Thank you again, Peggy and Julie, for your great hospitality and wonderful work of organizing this workshop. I hope all of the workshop artists practice what we have talked about and turn my understanding into your skills. Friday night, I did a portrait demo at the Albuquerque Artist League. This event was hosted by the Portrait Society of America. I was one of the six demo artists. I didn't get a chance to plan for this demo. It just happened to be that this event was overlapped with my workshop at the same city. This was my first portrait demo in public. I shifted into my "just do it" mode, and had no expectation what it would turn out. So here you go. This was I did. This is the second demo I did on the workshop. I tried to show many things with one: I painted a rose (sort of), a blue glass bottle, and a copper. The painting is a high key one. I am in Albuquerque, NM. I want to thank Peggy Jones and Julie Ford Oliver for providing this wonderful teaching opportunity for me. I want to thank all attending artists for coming. This is my first demonstration. This is a very strong group. I saw many artists in advanced level, and I am very happy to see many good paintings coming out in the afternoon. You may have noticed, my paintings of today and yesterday have shown perspectives above eye level. I felt like a child full of curiosity trying to figure out what mom has put on the table top. I am fifty some years old now. Bouncing around in the world for so many years has exhausted much of my energy. I feel tired and numb. Sometimes, I feel depressed too. But art is my therapy. This kind of above eye level setups refreshes me. We cannot resist the natural process of aging, but let try our best to keep our mind young forever. I have arrived at where I was about three weeks ago. I was working on high key with a lots of colors. I always consider that light (or value) is more important than colors. However, my recent high key approaches starts to shake my foundation. We know in history how strong was the impact of the Impressionist upon the tradition. Now, I am experiencing the same impact in my personal art history. So at this moment, I put “color before light”. I see more opportunities. There are still many beautiful ways to depict nature I haven’t managed yet. But I want promise to you that my history will be very different. I like this prop. It gives me so much color opportunities. I gradually come into my learning mode again. I don't have much to say today, but I surely enjoyed doing this small study. I was at the InSight Gallery this afternoon. Master artists Quang Ho and Scott Christensen were having two man show There. Both Quang and Scott did wonderful demos. I admire both masters. I met Quang many years ago, and so happy to see him again. We had fun talking about the similarity of our names. Our first names have only one letter different, and we have identical name initial: QH. I had several cases in art gatherings where people mistakenly thought I was Quang Ho. I was really flattered when that happens. At the mean time. It is always great inspiration to me when I get closer to great artists, physically or namely. It gives me tremendous motivation to improve my work. 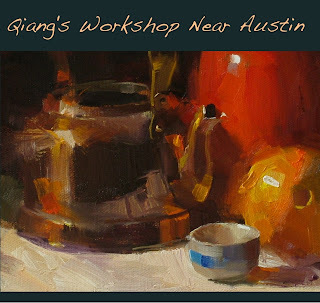 Many of my local artist friends asked me how come I taught so many workshops all over the places but not in Austin. Well, I don't have a good answer for the question. Now I have arranged a workshop on February 16 - 18, 2012, and my wife Song will organize it. Please click here for detailed information, and contact Song to sign up. For the friends who have contacted us before, now it is the time to secure your spots. We are looking forward to meeting you or seeing you again in the beautiful Texas hill country. I have been a PC person all my life until about two years ago I got my first Ipad. About a year ago, my HP died on me, so I got my MacBook Air on the first day it came out. Since then I have been happy instead of frustrated with computers. I usually do not include technology stuff on my paintings, but this one is exceptional. I share many Steve Jobs's beliefs. I hope all of us can follow our hearts and make something significant to both ourselves and the world. With same kind of spirit, I left my job (I am hungry) and stepped into a new field which I am not educated for and in a not very young age (I am foolish). Life is short. However, painting will turn that several hours of you at your easel into infinity. So happy painting and happy daily! After more than two weeks down time, I resume my small painting project again. My learning process lost it continuity and I am almost "back to the drawing board". So today I stay in my comfort zone. The painting is relatively low key and my colors are in light area. My business management is improving, and thanks to many of you sharing what you use. Life is so complicated nowadays. Simplicity is hard to come by. No matter where you are, I think we are all on the same boat. We are trying our best to be floating. BTW, my next workshop will be in Albuquerque, NM on October 13 -15. We have one opening. If you are interested in attending, please contact Peggy Jones. This is the 3rd demo. My intention was to show how to paint metal objects and get perspective correct. I have spent some time on the design. The painting involved size and shape variation of the props. The colors near the center of the focus capture the attention effectively. This a couple of years. My art has progressed and brought me more opportunities. My small paintings are selling well. I am traveling all over the place teaching workshops. I got more galleries who are interested in representing me. Now I start to realize that planning and managing all the activity is non trivial issue. I haven't had a good management system and tools to coordinate all the events. I merely put most of (if not all) things in my brain. Now I start to get an anxiety worrying that I might forget things. Sometime I wake up in the middle of night and questioning myself if I should be at another location. Recently I begin to search for any good system to manage my art. I have encountered a book called GTD (Getting Things Done) by David Allen, and started to use ICal to record my activities. I think it will take me a while to get a working system going. If you are workshop organizer, gallery owner, show planner, press, or someone who have any work relationship with me. Please send reminders to me before any events. I am learning and will catch up soon. If you are using an effective management system. I really appreciate if you let me know. Thanks. As usual, my second demo at the workshop was a rose painting. I am sorry the photo is not that good. There are quite amount of abstractness on this painting. I really want to achieve the spontaneity and give the viewers more room to think what is going on. I have come back to Austin. Song is back to normal. Now I can relax a little after a really busy life for about two weeks. I feel tired and I am going to bed now. I am teaching a workshop at New Braunfels, TX. This is my first demo. I want thank Mary McIntosh for organizing this wonderful workshop and artists from all over the place to attend my class. Song is much better now. She is back to normal. Her doctor told us that she does not need a surgery according to her MRI result. Thanks again to all of you who care.